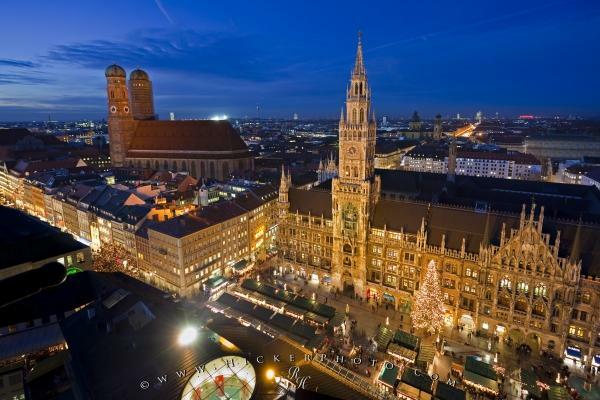 An annual event during the advent calendar, the Munich Christmas Market is held outside the the new town hall (Neues Rathaus). This aerial view is afforded from St Peter's Church. The new town hall, beautifully lit up at night, is the back drop for the annual christmas market in downtown Munich. This aerial view shows the famous Neues Rathaus, Marienplatz, Frauenkirche, and a small part of the city of Munich. Aerial view of the Christkindlmarkt (Christmas Markets) in the Marienplatz outside the Neues Rathaus (New City Hall) with the Frauenkirche, aka Domkirche zu Unserer Lieben Frau, (Cathedral of our Blessed Lady) in the background at dusk in the City of Muenchen (Munich), Bavaria, Germany, Europe. Aerial view of the Munich Christmas markets from St Peter's Church, Munich, Germany.